An enticing blond ale, complex and refreshing as a Belgian blond should be. 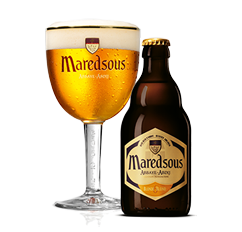 Maredsous blond was the abbey’s pioneering beer, and is still consumed daily at lunch by the monks. Complexity and depth of flavour, with a sprightly fresh spiciness, are followed by inviting fruit flavours, gentle creamy malting and a dry, hopped finish. Originally brewed only for Christmas, but far too good not to enjoy all year-round. 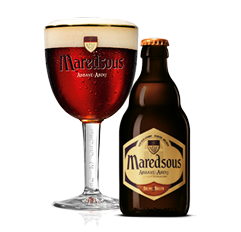 Maredsous Brune is instantly recognisable by its poignant bouquet, with roasted malt, dark caramel and touches of fruit exuding from the creamy head and continuing on the palate. The complexity of this marvelous brown ale stems from its lengthy bottle conditioning. A celebratory beer with incredible smoothness and character, the connoisseur’s choice. 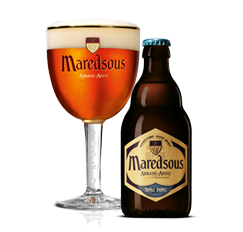 Maredsous Triple is a wonderful, golden-bodied, Belgian Triple. Adorned with festive sparkle, a creamy head and a luscious body, with a long balanced finish that resides delicately. Its refined smoothness and complexity contest the strong alcohol content.